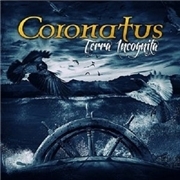 Female fronted Goth metal band CORONATUS hails from Germany. No doubt about that as seven out of twelve tracks are in German. After a departing lead vocalist the band opted for two! In place of Lorch now resides both the operatic Ladt Ada Flechtner and the rocking Mareike Makosch. Their fourth album has added qualities never before heard from the band, so to speak. Choirs, Folk elements and orchestral arrangements meet with catchy melodies and other metal ingredients. The opener “Saint Slayer” sounds winter trendy but is more of a barely ok opener. It may be easy listening, but it lacks the drive I expect from an opening track. But there is better to come. The odd part first, “In Signo Crucis” is more like a prayer, quite a forced meeting betwixt a soprano and metal, which leads nowhere. It is somewhat linked to the second dullest, “Hatefull Affection”, which is another forced concatenation of soprano and metallic edge. I think you get the drift, the meeting of opposites cannot be too afflicted by contrasts. But when they do the waltz like “Das Zchweite Gesicht” at full throttle their ideas work out to the max. The almost same goes for “Fernes land”, “Dead Man´s Tale” the 16th Century inspired “Der Kleriker” and the title track. CORONATUS are at best able to conjure the sweet and the heavy and form them into adjoining pieces of a unity. But when they still experiment with their new line-up and the possibilities it may or may not give…things can go out of hand.